The National Flag of India, also called the 'Tiranga', was adopted during an ad hoc meeting of the Constituent Assembly of the country. The meeting was held on the 22nd July 1947, twenty-four days prior to India's independence from the British (which took place on 15th August 1947). Based on the flag of the Indian National Congress, which was designed by Pingali Venkayya, the flag is also the war flag Indian Army, hoisted daily on military installations. 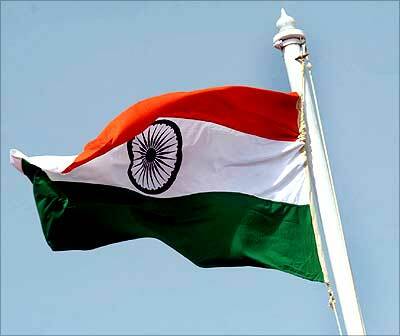 The heraldic description of Indian National Flag is Party per fess Saffron and Vert on a fess Argent a "Chakra" Azure. Design: National Flag of India has been designed in such a way that it forms a horizontal tricolor, with the colors - saffron, white and green, in equal proportions. The deep saffron (kesari) color is at the top; white is in the middle, while dark green forms the bottom. The ratio of the width of the flag to its length is 2:3. In the centre of the white band of the flag is a navy blue wheel, comprising of 24 spokes, which represents the Ashoka Chakra, seen on the abacus of the Sarnath Lion Capital of Ashoka. The diameter of the chakra approximates to three-fourth of the width of the white band of the flag. Flag Code: After 52 years, the citizens of India are free to fly the Indian National Flag over their homes, offices and factories on any day. On 26th January 2002, the flag code was changed, giving Indians the freedom to proudly display the national flag any where and any time. However, there are still some rules and regulations upon how to fly the flag, based on the 26th January 2002 legislation, which should be followed by the citizens. These rules and regulation includes certain dos and don'ts, which have been explained below. * A member of public, a private organization or an educational institution may hoist/display the National Flag on all days and occasions, ceremonial or otherwise, consistent with the dignity and honor of the National Flag. * No other flag or bunting can be placed higher than the flag. Also, no object, including flowers or garlands or emblems, can be placed on or above the flag. The tricolor cannot be used as a festoon, rosette or bunting.